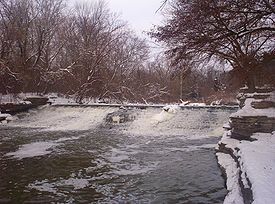 The River Rouge, also known as the Rouge River, is a river in the Metro Detroit area of southeastern Michigan. It flows into the Detroit River at Zug Island, which is the boundary between the cities of River Rouge and Detroit. Traditionally, the river has been heavily polluted. However, it has become much cleaner since a massive cleanup was implemented in the 1990s. Further cleanup measures are ongoing. The river's roughly 467-square-mile watershed includes all or parts of 48 municipalities with a population of over 1,500,000 and drains a large portion of central and northwest Wayne County, as well as a much of southern Oakland County and a small area in eastern Washtenaw County. Nearly the entire drainage basin is in urban and suburban areas, with areas of intensive residential and industrial development. Yet, more than 50 miles of the River Rouge flow through public lands, making it one of the most accessible rivers in the state.